Wear your natural blush, day in and day out. This winter, treat your skin to the Lakmé Fruit Moisture day and night regime. Enriched with fruit extracts and formulated with Nutritiv Moisture Technology, the soft textured Lakmé Fruit Moisture day & night crémes keep your skin moisturized and nourished. This winter keep everyone guessing the secret behind your blush. 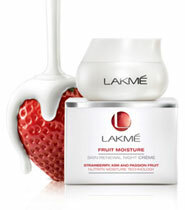 Indulge in Lakme Fruit Moisture, a range of moisturizers and cremes formulated with Nutritiv Moisture Technology. A potent blend of Hydrating Agents, Essential Vitamins, Anti-Oxidants and AHAs, this breakthrough technology along with fruit extracts makes sure that your skin is well moisturised and nourished. Giving you a natural blush, that's hard to miss. This Fruit Moisture day créme nourishes your skin through the day. It's a deep-moisturizing blend, with honey and avocado, that helps replenish your skin and regain its natural glow. Formulated with Nutritiv Moisture Technology, it seeps into your skin's deepest epidermal cells and implants them with intense moisture. SPF 9 shields your skin from the winter sun. Result: Healthy looking skin that is also protected from the winter sun. Plums are rich in vitamins and minerals that are known to give you healthy looking and glowing skin. Peaches, a natural source of AHAs, help hydrate your skin, giving it a healthy blush. Before calling it a night, rejuvenate your skin with Lakmé Skin Renewal Night Créme. A blend of juicy strawberries formulated with Nutritiv Moisture Technology, it works with your skin's natural night-time renewal process and moisturizes your epidermal cells. Kiwis, passion fruit and anti-oxidant rich strawberries leave your skin soft and moisturized with that natural blush. For best results, follow with the Lakmé Fruit Moisture day créme the next morning.